Editor’s note: The kangal (pronounced khan-ghahl) is a breed of large livestock guarding dog originating from the city of Sivas in central Turkey. The breed is not used for herding, but to defend flocks of sheep from wolves, jackals and even bears. The kangal is such an effective guardian that it has been imported to the U.S for the purpose of protecting livestock from wolves, lessening the need for more extreme control measures such as wolf culls. In the piece below, Bernd Brunner, a writer who splits his time between Germany and Istanbul, explores the relationship between these fearless dogs and their Turkish masters. The independence and courage of these hard-working animals is the stuff of legend, and exporting Kangals from the country is forbidden. The history of the dogs is intimately tied with the history of Turkey itself. But as the forces of modernity find their way into the furthest reaches of Anatolia’s wild plateaus, the role of the Kangals is changing, too. Fields of wheat alternating with barren steppe and rocky slopes, as far as the eye can see. There’s little to look at beyond a herd of cows blocking the sparse traffic and a gaggle of geese passing by. Yet the high plateau of Anatolia has a certain barren charm. Here – 350 kilometers east of Turkey’s capital, Ankara, south of Sivas and just outside of the town of Altınyayla – I meet Ümit Taşdelen exactly as planned. The 28-year-old breeds Kangals, the typical livestock-guarding dogs of Anatolia. His kennel houses about a dozen dogs and a single wolf cub. He welcomes me by jokingly encouraging two massive but fortunately chained males to lunge at each other. Turks and their dogs have a complicated relationship. Since dogs are considered unclean in Islam, just the thought of dog drool on a prayer rug fills many Moslems with revulsion. For this reason, highly religious Turks don’t even let dogs into their homes. But the freedom-loving Kangal is not the least interested in coming inside. This independence makes the breed ideal for Turkey. And the country’s human inhabitants respect these strong, self-reliant dogs: the Kangal even graces an official Turkish postage stamp. Their black “masks,” muscular bodies, and remarkably large paws give Kangals and impressive appearance. The animals are large and heavy: an adult male averages about 60 kilos, and some weigh much more. This considerable size puts them in the same category as Great Danes and mastiffs. For some Turks, this still isn’t enough. They refer to Kangals as “Anatolian lions,” undeterred by the fact that lions are actually cats and can easily outweigh even these large dogs three times over. 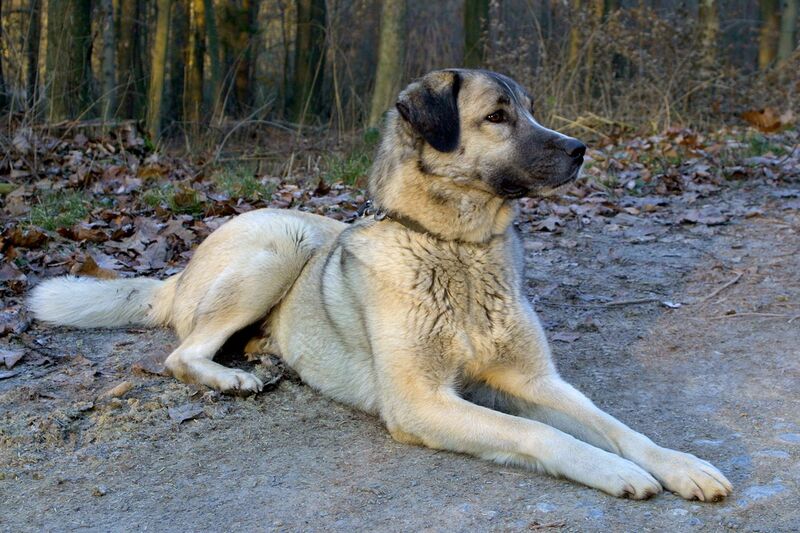 Kangals form part of an extended canine family that includes the akbash (“white head”, Turkish “Akbaş”), the karabash (“black head”, Turkish “Karabaş”), and the Turkish greyhound – all of which are considered “Anatolian herding dogs.” However, tests have shown that the Kangal is genetically distinct. Despite this evidence, the World Canine Organization (FCI) has not yet agreed to recognize the Kangal as an official breed – instead, Kangals and their akbash relatives are collectively classified as “Anatolian shepherds.” For a layperson, these categories can be bewildering. A dog that qualifies as a Kangal today would have been considered a karabash in the past. Furthermore, a dog of any of these related breeds may be advertised as a Kangal to make it more attractive to potential buyers – or as an akbash to get around the prohibition on exporting Kangals to other countries. Breeders also draw finer distinctions based on characteristics such as the dog’s coat or tail. The name “Kangal” derives from a family formerly known for breeding the animals, who lived in a nearby town of the same name. Kangal, Kangal all the way. If a Kangal will be used to guard sheep, its trainer begins leaving it alone with lambs as a puppy to ensure that it becomes accustomed to their smell of lambs. Starting at the age of five months, the dog is also exposed to a wolf’s pelt to sharpen its ability to recognize its future foe. A collar with large spikes protects a working Kangal’s vulnerable neck against bites. In contrast to the romantic images we often have of shepherds and their canine companions, a Kangal in the Anatolian steppe does not stay by its master’s side. Instead, it operates independently. The dogs never act aggressively toward the sheep in their care or even bark at them – they only task is to protect the flock from outside threats. “The optimal situation is to combine two males with a female,” says Ümit Taşdelen, the young breeder. Kangals on the job benefit from the flat, open landscape – since it allows them to observe the terrain across hundreds of meters, they don’t need to patrol long distances. Shepherds refer to a successful dog as “a Kangal that strangled a wolf.” But despite their strong emotional bond to their helpmates, they use a heavy hand. For example, they often crop the dogs’ ears, not only to make the animals less vulnerable to attack, but because they believe that the dogs hear better this way and can more easily sense the sound of wolves approaching. Each day, a working Kangal eats a meal of yal, a mash of barley and bran cooked with butter, milk, salt, and sugar. Kangals also eat sheep that die of illness or injury, which are considered unfit for human consumption. A feast like that is enough to satisfy a dog for a week. In the popular imagination, a watchful dog guarding the flock is an essential ingredient of an Anatolian idyll, but in reality the sight is increasingly rare. Flocks have gotten smaller, and fewer wolves are around to threaten them. Traditional grazing practices are given way to industrialized farms. Young people are rarely inspired to take up the lonely life of a shepherd, especially with Turkey’s booming cities beckoning them. Even the Turcoman nomads, who often roamed the countryside with a flock of sheep and a watchful Kangal just a few decades ago, have largely succumbed to the pressure of modernization. Taşdelen’s love of Kangals has its roots in his childhood, and he always knew that he would become a breeder once he completed his schooling and required military service. His efforts have earned him a number of prizes at dog shows. He proudly shows me the pictures of past competitions displayed in his simple house next to the kennel, as well as his painstakingly maintained breeding log. While he can make good money selling his dogs, he doesn’t just see them in financial terms. “Kangals are emotional and loyal,” he says. “I like their friendly natures. And they fear nothing except for their master, and fight with everything they have.” In any case, breeding is a hard business. Although it seems highly unlikely to me that a thief could steal a dog from the kennel without risking life and limb, Taşdelen or one of his two employees stands guard every night. Today, very few of Taşdelen’s customers are traditional shepherds. Most of the buyers want a watchdog for their homes. Riding through the villages, I occasionally catch a glimpse of the mighty dogs in the courtyard of a house or a factory. But owning a Kangal is a challenge. The dogs need constant activity, and bored Kangals can develop behavioral problems. At the same time, Kangals that lead a more settled existence live longer than their counterparts on the steppe, who must be ready to defend their charges at all times. “Here a Kangal has a good chance of living to the age of thirteen instead of just eight, like most dogs in the wild,” Taşdelen explains. Kangals are exceptionally resilient, capable of withstanding even extreme temperatures. Still, I have to wonder whether brutal cold really makes the dogs feel “reborn,” as the shepherds claim. Kangals also supposedly have a soft spot for women and children, as well as the ability to sense when people have ill intentions. When it comes to the accounts of Kangals that circulate in Turkey, it’s impossible to unravel actual observations from superstition and folklore. But the claim that the dogs instinctively withdraw into the wild when they sense death approaching seems plausible enough. People in Asia Minor have been keeping sheep for ten thousand years, and dogs played a role early on. Were they Kangals? Or did the species arrive in Anatolia later, after traveling from Central Asia alongside the Turks? The historical evidence is scant and imprecise. The writings of Evliya Çelebi, a legendary Ottoman traveler in the 17th century, mention the watchdogs used by the empire’s elite warrior troops, the Janissaries. In his account, the dogs are as fearless as lions and hail from the coast of Africa. Çelebi writes that they would attack wolves and were even willing to go head to head with dragons. That’s the legend, anyway. 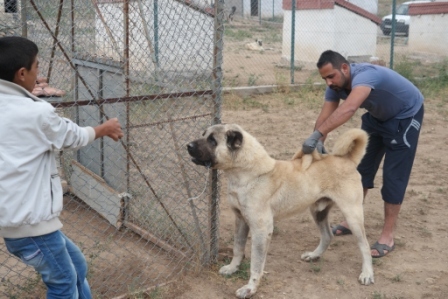 Vahdettin Altunok, a scientist from the Selçuk University in Konya who performed the genetic research on the dogs mentioned earlier, claims the Kangal is related to the large hunting dogs of Mesopotamia. For a number of years now, dog shows have taken place in the Sivas region, and Turkey’s government subsidizes the breeding of Kangals. As a result, the breed’s survival is certainly assured. Although exporting the animals is officially prohibited, Kangals have also made their way throughout the world in the last fifty years. Today, the dogs are bred in Europe, North America, and Australia, and they can even be found guarding goats from leopards in Namibia. ©Bernd Brunner. Translation Lori Lantz. Bernd Brunner is a writer who divides his time between Istanbul and Berlin.